Routesetting: Initial Set with Brendan Baars — Terra Firma Bouldering Co.
Terra Firma: Hey Brendan! Thanks for taking the time to chat. You’re the head routesetter here at Terra Firma and you’ve had your hands in everything TF related since we were just a sparkle of an idea. Tell us a little about yourself, why you decided to partner with TF, and what you’re excited about for the future as our head route guy. Brendan: Hi! My name is Brendan Baars and I’ve been climbing for 6ish years! I was introduced to climbing from a friend and was innately drawn to the sport because of the challenges that it offered. In my life, I was looking for something that was both thought-provoking as well as physically challenging and that is exactly what I found climbing to be. Climbing to me, offered a chance for me to challenge myself in every facet. Through that, I was able to garner a better understanding of what that was through routesetting. I entered climbing to challenge myself, but I have developed my routesetting to help challenge others. Terra Firma: Okay, tell our readers about the initial set for Terra Firma. What was your inspiration? What did you want to achieve? Brendan: The initial set was such a challenge to get right! Luckily my team did a great job keeping in mind the challenges I had set for them and I think we did pretty well. In addition, Tony Accuardi who is the Headsetter at Rock Mill (Akron, Ohio) came out and helped us with the opening set as well! My inspiration for the set came from the new holds that the gym bought from Kilter and Rock Candy. As soon as those holds came in, my imagination started to run! It was fun and challenging to set for all types of skill levels as well as for multiple body types. It can be very easy to forget that most of the problems in a gym need to be set for someone that is 4’8’’ as well as the people that are 6’2’’. The challenge is making most of the problems accessible to all body types and at the same time fun for everyone - I feel like we achieved that in the initial set. Terra Firma: Can you tell us a bit about the role of aesthetics within the routesetting philosophy at Terra Firma? Brendan: So let us start like this, a professional painter (Cody) once told me that to have a world class painting, you need to be able to observe and discover something new or insightful from three different distances from a painting. The first is from 20 feet. The second from 5 feet. The third, from 1 foot. What does that mean? Let’s dive deep! For Cody and I, creating a space that from a distance is appealing was paramount. We wanted users to enter our main bouldering room, take it in, and say WOW. During this phase you can observe the complimentary colors and the general aesthetic nature of the wall as well as the different problems set. If we zoom in too the middle distance we start to observe patterns of specific problems as well as see which way a hold is facing and be able to work out the general beta for a certain climb. The last and closest look from a climbing perspective is touching and climbing the problem. In this way you experience the problems complexity and feel the movement that was set and the way it was meant to be climbed. And to achieve all of that, we spent a painstakingly long time working with two of the best hold companies (Kilter and Rock Candy). Many gyms across the country are starting to set monochromatically, and we were naturally drawn to that trend. That said, what we differed on was the amount of colors we chose. We only have five colors, which is far below the industry norm. We did this because it gave us more holds in each color, so that our setters had more choices to choose from. So far, this has worked out splendidly. On the note of aesthetics, I would like to mention that Cody did an amazing job with sketching up the wall design. I won’t go into detail here, but he is now an expert in wall design and he can talk your ear off about the different aspects of designing the perfect wall with all the right angles, no triangle pieces, blah blah..Ask him, it’s pretty interesting. Terra Firma: For the initial set, you worked side by side with the Terra Firma founder, Cody Erickson, your team of setters, as well the Headsetter of Rock Mill, Tony Accuardi. Would you tell us what it was like to work as a team rather than solo? What did you learn from that experience and how do you think it will shape your future sets? Brendan: Before this I knew how to set and that was fine and all, but I had never really set as a team. Meeting Tony was definitely awesome. I was sent to the Rock Mill gym to learn how things are done at a professional gym with regular route turnover and people that set more as a group than I’d ever seen. Basically, what stuck out the most for me was what Tony happily calls the first routes they throw up skeletons. Setting skeletons basically means he gave us 2-3 hours to set our problems that he had given us. We set them as good as we could in the given time and then spent even more time than we did going over each person’s problems as a team critiquing and climbing each problem until it was perfect. Sometimes nothing needed changing, and sometimes many things needed it. I learned many things from Tony and am happy to say that what I learned can be seen in our opening set as well as the coming months! We have so many plans for the future and we can’t wait to get to setting more problems next week! I hope that it’s very obvious what my setting team and I are trying to accomplish. Terra Firma: What was your favorite route from this set and why? My favorite is probably the black problem near the mini prow. It’s my favorite because it was set by Cody, our newest setter (also my boss) and I’m pretty proud of him for being able to create a type of problem that really can only be done one way! It’s not my personal favorite type to climb, but it gets my vote for best problem for a variety of reasons - it’s a crowd pleaser, and a rad problem. My second favorite is one of the harder problems that is upstairs in the cave. The pink crimpy test piece set by Mike Bienick is so much fun because every move reminds me of Daniel Woods climbing, in Search of Time Lost. If any problem in the gym needs tension between your fingers and feet, it is this one. It is on you the whole time. Terra Firma: Climbing outdoors is way different than climbing indoors. How has your outdoor bouldering experience inspired the way you set within a facility like Terra Firma? I paused here…After thinking about it, the thing that sticks out the most is usually on an outside boulder you have the ability to climb an established problem using a variety of methods. You can usually find different feet or a method that works better for you than what your buddy did. If you take that to climbing on plastic, you can add additional feet for different body types or additional holds that may not be used by some. But what is cool about setting inside is that you can do the exact opposite of that, if you wish. Many times, it’s my goal to set a problem with very specific movement that I want to force the climber into. So both ways are good to know and use. I also get some of my inspiration from the things that I climb outside. Analogously, the rock lends itself to me in a way that I can take something that I saw outside and attempt to mimic it within the gym. Terra Firma: Your team decided to go with a general grading scale rather than solid grades on each route. Why did you choose to go that route? Brendan: After much deliberation and thinking we strayed away from giving each boulder a specific grade because it doesn’t really help anyone. Before I go further, I’ll be the first to admit that I love grades and reaching milestones. However, I don’t think it’s necessarily healthy to set by grades because for one person a problem may lend itself to that persons strength so they would personally rate it a v4. But for another, it may be a weakness, so to them it's a v5. Basically we tried this approach because it still gives them a grade range to hit but it may help limit the “bickering” about why the routesetter called it a v4 and nothing else. It is a personal choice, and if people choose to try to grade each problem in the gym specifically with friends, then more power to them! Terra Firma: From the looks of it, your team will be staying busy this year with complete route turnovers each month (yay, more climbing for all!). How did you decide upon how long each route will stay up and why? Do you think that working on new routes quickly will help fuel creative routesetting? Brendan: Yes! Each month the gym will look completely different! Well first we are going to strip and reset a quarter of the walls each week. We decided this based off of talks with other setters at gyms around the country. It’s faster or equal to many of them. Giving the people 90ish problems each month will fuel them to climb more and always give them something new! We wanted to bring the absolute best quality of setting that we are capable of giving to West Michigan in terms of quality and route turnover. It’s amazing that we are able to do this, and our members should totally take advantage of it. I think that it will help climbers by never leaving them wanting more. Terra Firma: Thanks for taking the time to let us pick your brain, Brendan. 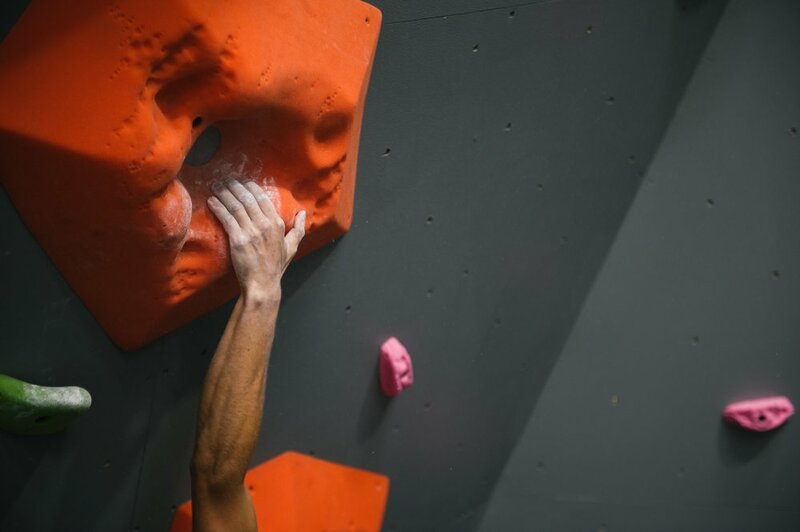 We’re really excited to see how you help build up our bouldering community here in Grand Rapids! Brendan: Thank you, this was fun! I also wrote a lot. I encourage anyone to come find me if you want to hear more about the philosophy that we have at the gym!